Dawg, your clips totally blow me away! I always review pickups based on their clean tones first and the cleans here in your fingerpicked style sound better than similar clips I’ve heard from original PAFs by Gibson from 1959! These are as close to perfection as pickups can get! The middle pup tone has more than magic, it sounds like wizardry. Can’t wait for my set to arrive. Thank you, bro, for giving us such a detailed background on these incredible pickups!!! Absolutely my pleasure! When I first plugged the guitar in at my luthier’s shop, both he and I noted that this is what a Les Paul should sound like. Even clean, there’s a noticeable “bite” to the sound as the pickups pick up those super high-end frequencies, but it’s not so much that it’s off-putting. Especially in the treble position, you get that Les Paul “honk.” This is what I felt was missing with the stock Burst Buckers. The guitar sounded much to smooth with those. These pickups are fantastic at bringing out that Les Paul character! Can’t wait til mine arrive! Didn’t you say you’re getting the Zero’s? I really liked those from the clips as well. Dawg, how does the bridge pickup sound with a lot of distortion? 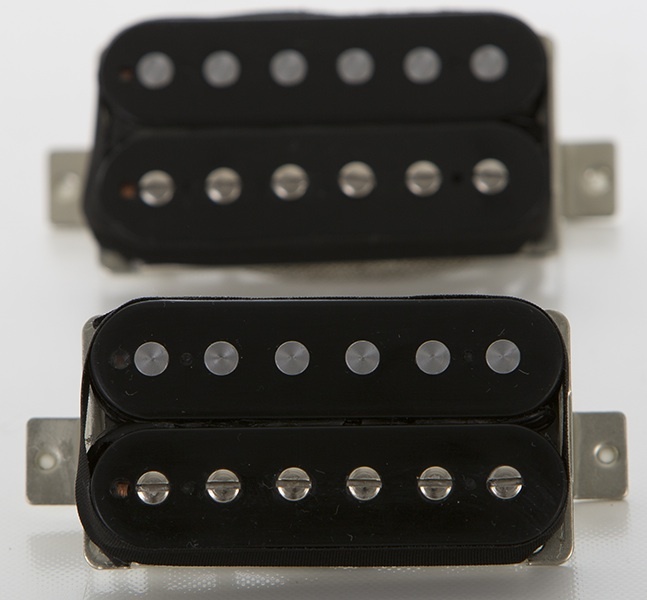 In a word, the bridge pickup sounds “scary.” Not as in dark or sinister, but “scary” good. Unlike other vintage pickups that are extremely bright when cranked, the Deacci’s retain the bottom end, so what you get is a much richer sound than you’d expect. Even the luthier that did the install commented that he was amazed at the bottom-end retention of the bridge pickup. You can hear for yourself in the lead break clip for the “The Hit” I did above. Even though there’s a bit of delay and reverb added, when I make the switch to the bridge pickup, the tone is much brighter, BUT it’s still super-rich. One your Clean Fingerpicked samples, the bridge pickup sounds more delicate, transparent and shimmery than the best PAFs do on their neck setting! These are legendary!!! Dawg, I keep replaying your clean fingerprinted sample clip over and over. That’s one delicate, gorgeous melody and I’ve never heard the tonalities I always knew the Les Paul was capable of rendering expressed so well. These pickups and that riff are wonderful. Why don’t you do an album of instrumental pieces like this? I’d be your first customer. OK, never ever heard such open, atmospheric tone in my life!!! What effects, if any, did you have on this recording? Fabulous! And my Deacci’s just arrived. Jazzed beyond words! Thanks! All the effects are Logic Plugins. For the guitars, I used a Silver Compressor and reverb and stereo delay. For the rhythm part, I used the middle position on the guitar, and for the “lead” used the neck position with the tone number down to about 5. I also increased the wet/dry mix on the lead to give it more ambience. Then to emphasize the ambience, I added a warm pad. That really helped get that atmospheric effect. Yes, the Zeros. Can’t wait to try them! I’ve had a set of Declan’s humbuckers in my Edwards Les Paul for a few years now & love them – they wiped the floor with the stock Duncans which came with the guitar. I helped Declan with the soundclips for the Pure Vintage sets. Great to see others beginning to benefit from the tonal improvements these great pickups add to their guitars! I ended up selecting the Pure Vintage Twos for my 96 Gibson Les Paul and don’t think I’d trade them for a set of original PAFs at this point. They nail the sound I’ve heard on so many recordings from the 1950s and 60s. Les Paul organic woodiness with plenty of clarity and crunch. I love mine!!! Even though I haven’t had time to record in a couple of months, I’m still blown away by the sound of these pickups. It’s a totally different guitar than the one I bought a few years ago; and to think that was considering selling or trading it. Not a chance.